Using simple technology developed primarily for producing electricity from hydrogen, a team of researchers from the University of Wisconsin-Madison, University of Massachusetts-Amherst and Gwangju Institute of Science and Technology of South Korea has developed what could be a commercially viable, continuous process for converting biomass and electricity into renewable liquid transportation fuels. 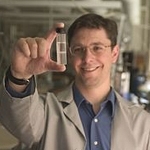 George Huber, a UW-Madison professor of chemical and biological engineering, and his collaborators have demonstrated they can use a proton-exchange-membrane fuel cell to convert the model biomass compound acetone into isopropanol, a chemical compound with a wide variety of pharmaceutical and industrial applications, including as a gasoline additive. The advance paves the way for researchers to convert biomass molecules such as glucose into hexanes, which are significant components of gasoline currently derived by refining crude oil. "Essentially, we are making renewable liquid fuel that fits into the existing infrastructure," says Huber, whose team published its results in the Sept. 7, 2012, issue of the journal ChemSusChem. Unlike other technologies that use large quantities of expensive hydrogen gas to convert biomass to biofuels, the team's process is driven by electricity, which is inexpensive and readily available in rural areas. "And, we're storing the electrical energy as chemical energy," says Huber. A fuel cell converts chemical energy into electrical energy, or vice versa. Reactions in a proton-exchange-membrane fuel cell require only water, electricity and the biomass-derived molecule. The proton-exchange-membrane fuel cell consists of two "halves," separated by the proton-exchange membrane, which looks somewhat like a thin sheet of plastic wrap. On one side—the anode side—there is a positive electrode coupled with a catalyst that facilitates the chemical reaction. The other side—the cathode—consists of a negative electrode and a catalyst. To reduce biomass molecules into fuel, Huber's team feeds water into the anode side and passes an electric current through the water to generate protons and electrons. The electrons run through a circuit and the protons pass through the proton-exchange membrane to the cathode side, where they generate hydrogen. The hydrogen reacts with the biomass molecule and reduces it to fuel, while oxygen exits the system. Huber's team demonstrated the biomass-to-biofuel reduction process in a continuous-flow reactor, which continuously and efficiently moves reactants through the system. Another advantage is that the process yields 50 percent more liquid fuel over ethanol fermentation processes. At the production level, the process also could be modular, says Huber. "This is potentially a scalable technology where you could make these proton-exchange-membrane-type reactors in the field, close to the biomass, and run them at night when you have cheap electricity," he says. In future work, Huber hopes to improve the catalysts and membranes in the fuel cell to make the process more efficient. And, while his team used acetone and a few other molecules as their proof of concept, one of Huber's goals is to repeat the process with sugar. "With this approach, you could take water and glucose and run it through the fuel cell circuit to make hexane and oxygen," he says. Huber received support for the research from the University of Massachusetts Commercial Venture and Intellectual Property Technology Development Fund.